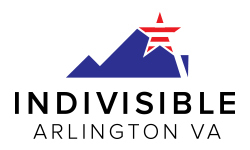 Indivisible Arlington is one of over 6,000 grassroots Indivisible groups across the country taking action to resist the Trump Administration, get out the vote to elect progressive leaders, and realize bold progressive policies. • banners, posters, and buttons for our members to carry/wear at marches and other events. Note: The Indivisible Project keeps a 10% fee from the money Indivisible Arlington collects. This covers: lawyers and accountants to ensure the money is handled and spent legally and to fill out compliance reports; staff time to manage the vendors and provide fundraising resources; credit card processing fees through the ActBlue platform; and the cost of the debit card that allows us to spend the money. Please contribute today to Indivisible Arlington. Together, we will win.